Vandyvape is back with a great piece of kit. The Apollo kit is a rugged, lightweightstarter kit with a 2 mL MTL Tank The AP tank takes BSKR MTL coils, both nichrome horizontal coils at 1.5-ohm and 1.8-ohm coil. 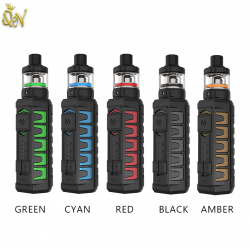 What makes this kit stand out from the rest is its IP66 rating of the mod making it shock, water, and dust resistant. The AP mod comes with a 900 mAh battery, and it’s adjusted in 0.2-voltage increments, from 3.2 volts to 4.0 volts (with a max output of 20 watts). The Aplollos build is robust yet very practical as it uses the same coils as the Vandy Vape BSKR MTL Tank. The AP oozes coolness in design and functionality, being water,shock and dust resistant is a great feature for all. the grip of the Apollo has a rubber finish made from TPE that lays over frosted coloured detailing that houses the built in 900mah battery. The dimensions of the AP mod are mod are 76 mm x 28 mm, and it weighs only 54 grams, making it pocket friendly. The square buttons are a pleasure to use, and they’re shaped and placed well for ease of use. They’re clicky and responsive. Lastly, the front-bottom micro USB port is covered and sealed with its own little rubber door. Apollo AP tank is a bonafide MTL tank, just like the BSKR MTL tank also from Vandyvape. And the Apollo uses those same coils, both horizontal nichrome coils (1.5 ohm and a 1.8 ohm). The AP tank goes from an open MTL all the way down to an incredibly tight draw with almost no airflow, making it ideal for nic salts. The air holes are adjustable from 2.5 mm, 2.0 mm, 1.0 mm, 0.8 mm, 0.6 mm via an airflow ring that has enough resistance to it to not spin freely. The 0.6 mm air hole is like a pin hole, and it’s tighter than the tightest setting on the BSKR MTL. The tank comes with a spare glass, and a tool for disassembling (if you misplace the tool, you can dissemble the tank with needle nose pliers or the like by inserting into the wide dual-slotted fill ports and twisting). Unfortunately, the tank uses a proprietary drip tip, so you won’t be able to swap for 510 tips. But, the bore on the AP tip is narrow and appropriately restrictive for the type of draw this thing delivers – and it’s an overall nice drip tip with thick walls to help reduce heat transfer. the Apollo AP kit is solid for what it’s meant to do: provide a MTL hit of varying degrees of tightness while being easy to use. I’ve had zero mishaps with the mod or the tank. The mod performs as it should, and the battery lasts a long time (at least a day of continuous usage). Charging the mod fully took 88 minutes. Vandyvape says you can get two days out of one charge, but that’s obviously going to depend on how much you vape. AP is a great workmans MTL kit whislt at the same time a trip to the pub or a night out would do it justice, this meaning its shock resistant casing can handle a drop or two. The MTL quality is constant and in my oppinion ranks as a whole above the BSKR.